If you’re struggling with finding the time to make healthy food for yourself throughout the week, prepping might be the perfect solution. I don’t necessarily mean cooking everything you’re going to eat throughout the week and packing it into a million containers (although, you could do that too)… You can also think of prepping as simply making things easier on yourself. 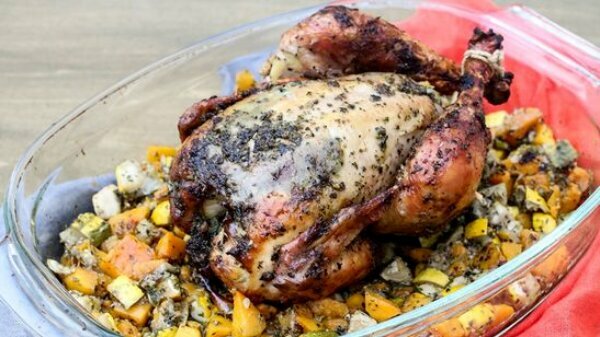 What few things can you do at the beginning or end of the week to making preparing meals a lot faster and less of a hassle? For me, preparing large dishes that can be used in a variety of ways throughout the week is a total time saver. 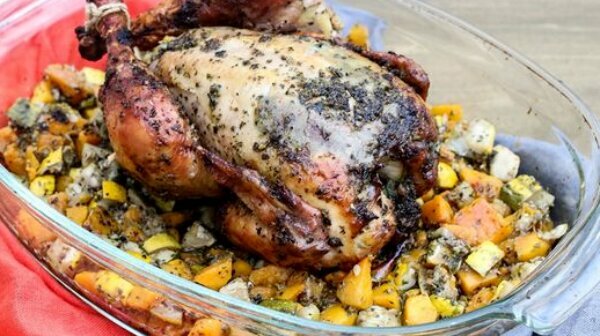 Roasted chicken (especially when it’s paired with roasted veggies) is a great example of a perfect dish to prep for the week ahead. 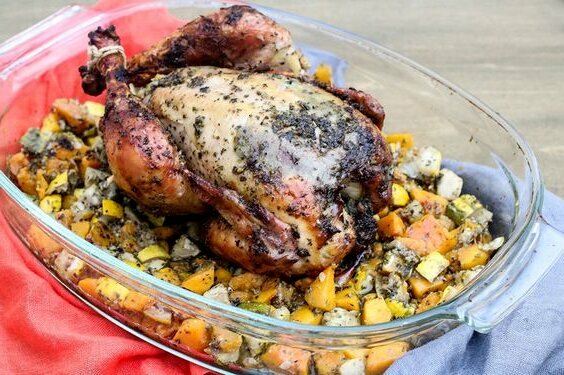 You can enjoy the chicken and roasted veggies on the first night, but save some of the meat to make chicken salad later in the week. The leftover veggies can be eaten on their own or added to a couple of salads. My favorite thing about this roasted chicken recipe is that it uses all seasonal, local ingredients from my local farmers market. The combination of both winter and summer squash plus fresh basil make this dish the perfect early fall meal. My second favorite thing about this recipe? It’s made with 6 tablespoons of Tin Star Cultured Brown Butter. Need I say more? In a food processor, combine ghee, garlic, basil, oregano and onion powder plus salt and pepper, to taste. Add 1-2 tablespoons mixture to chopped veggies in a large baking dish and mix until well combined. 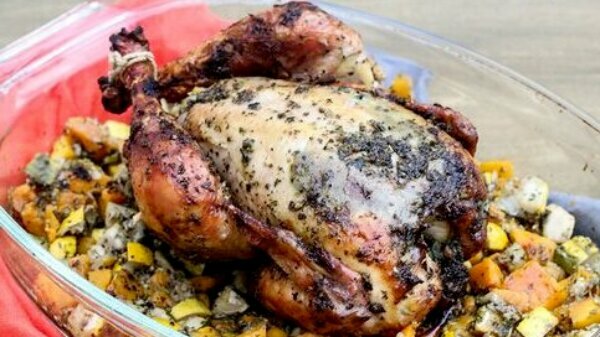 Place chicken on baking rack in baking dish. Rub remaining basil and garlic mixture all over the chicken. With a knife, gently lift the skin and carefully push some of the mixture underneath. 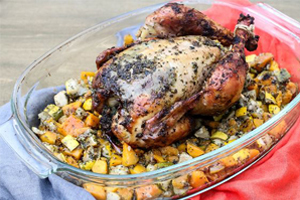 Cook chicken and squash on 425 for 1 hour. After an hour, turn the oven down to 375 and cook for another 45 minutes - 1 hour until skin is golden and the internal temperature reads 165. Love the recipes and words of wisdom.